Rooms and Beds 156 total rooms, 380 total beds, 16 connected rooms, 8 family rooms. Sea, mountain views are available. 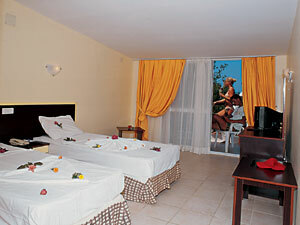 Telephone, music, balcony, minibar, safe box, television, satellite tv, split air condition, hair dryer, telephone in bathroom. 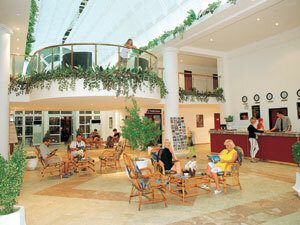 Dining and Wining Half board, breakfast lounge, cafeteria, fast food unit, pool bar, beach bar, disco bar, snack-bar. 1 A la carte restaurant (150 pax), 1 open buffet restaurant (400 pax). International Cuisine, Turkish Cuisine, vegetarian cuisine, Mediterranean Cuisine. Meetings 1 meeting room (25 min. 75 max. capacity). Overhead projector, whiteboard, sound system, microphone, video player, DVD player, television, fax, light system, internet. Facilities and Services Split air condition, garden, tv room, game room, hairdresser, laundry, dry cleaning, market, gift shop, 24 hrs room service, power generator, doctor or nurse, parking without fee, health cabin, artificial waterfall. Leisure and Recreation Outdoor swimming pool, children swimming pool, Turkish bath, sauna, massage, , amphitheater, children's playground, gym. Sports Table tennis, billiards, disco, night animation, sports animation, mini football, volleyball, beach volley, basketball, jogging. Water Sports Banana, jet ski, canoe, wind surf. Location At the beach, private beach. Transportation Kuşadası 14 km, Ephesus Ancient 30 km. İzmir Adnan Menderes Airport 80 km.